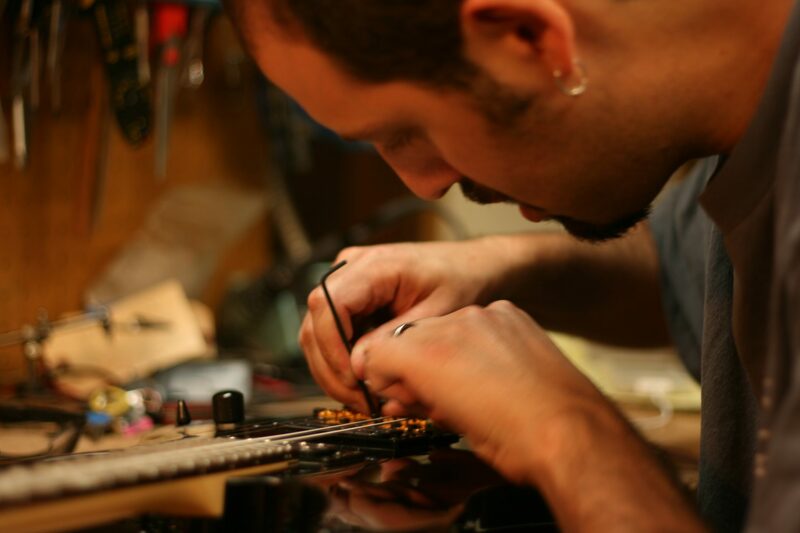 Avi (Avishay) Shabat is a professional luthier and guitar technician based in Los Angeles, California. Shortly after graduating from the Algranati School of Luthierie, Avi moved to L.A. and began apprenticing for a few local guitar repair shops. In the year 2008 he started working for Lance Lerman, who started a boutique guitar company—LSL Instruments. and Keith Urban,Sean H. of Smash Mouth; Anna Nalick and Judith Hill, Slash, guitarist Carl Verheyen from Supertramp and CVB; studio/Country guitarist extraordinaire Steve Trovato; producer and guitarist Jerry Donahue, member of guitar trio The Hellecasters; guitarist Ricky Z. of the Steve Lukather Band; Brian Wooten, lead guitar player for Trace Adkins; Walter Becker of Steely Dan. 311 ,Slash, Bush ,Jamestown Revival, Hubastank, Kelly James, Gonzalo Bergara Quartet, Queensrÿche, and many more..
Avi’s intuition and passion are felt when you play a guitar he has built or set up. His expertise as a live-show guitar technician has given him the insight of what a working guitarist needs to attain optimal performance from his instrument. Avi’s devotion to his craft resonates in the integrity and pride he brings to his own workshop. He is committed to achieving the best sound and playability for every instrument he touches. We are located in 22700 Haynes Street,West Hills, CA 91307 . Call the shop to get directions.